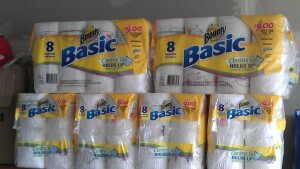 Bounty Basic Paper Towel Deal at CVS Through 1/28 | A Savings WOW! With four kids in our house, we always have a need for paper towels. We have a roll in the kitchen, one in each bathroom, and in our cars at all times. They are also on the kids’ school supply lists, so we use them for that, too. We used the deal at CVS this week to stock up on more paper towels. The end cost per Bounty Basic paper towel roll is $0.49 each. I have a coupon that say save $1 off ONE bounty 6-roll towels or larger (only 4 alike coupons). Will this coupon work for this deal and if so it will reduce the oop and the end amount will be reduced to 0.43 per roll. Am I correct?? Yes, you should be able to use that coupon (if it’s a manufacturer’s or CVS coupon). If you use 4 of those coupons, then your final net price will be $0.43 per roll. Thanks for the details! You make so easy.